The subtitle for Barb Lee’s Adopted film is “When love is not enough …”. What kind of love is she talking about here? I argue that love is enough. The love I know came in the form of handmade, Korean clothes for me and my entire brownie troop. That love also displayed all my Asian dolls on shelves in my room. That love stood between me and the bullies who hurled their personal insults and attacks at her. That love forgot that I couldn’t bear her red-headed grandchildren. That love wore small, silver Korean shoes (Hwahye) on her charm bracelet. That love cried as hard as I did on the day I moved to Rwanda, shortly after my wedding. That love wrote letters almost daily and sent them across the ocean to a post box in Kigali. That love’s eyes twinkled the first day they set their sights on her first grandson … this, despite the fact that her lips were silenced by a stroke. 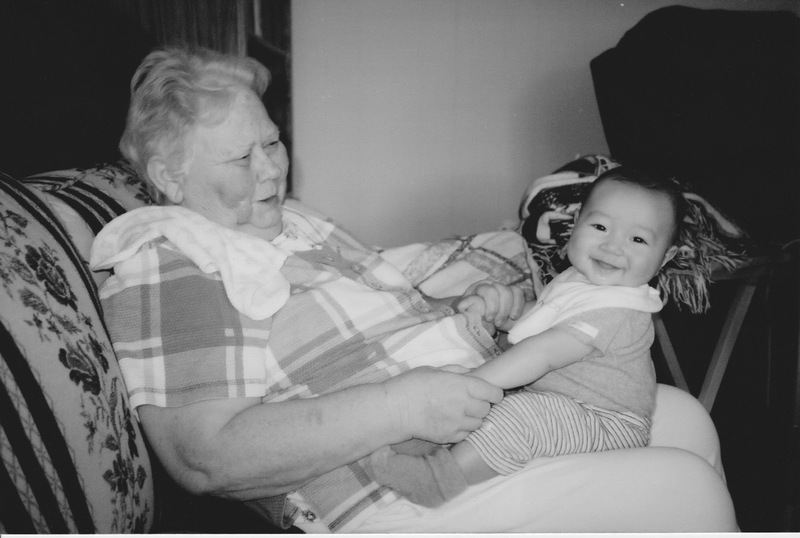 That love worked tirelessly to be able to have this moment with her first grandchild. She left us twelve years ago on this day. But her love is here and growing in me, my sister and our children. Her love will forever be with us, and that is enough. This entry was posted in Adopted by Barb Lee, Asian, bullies, grandmother, insults, joy, Kigali, Korean, love, mom, mother, Rwanda, sister on February 2, 2013 by mothermade, the blog. Living in Rwanda, my husband experienced something I had felt for a long time. He could not hide the fact that he was different. When we were in the market, kids and adults would point and whisper (though he could hear), “Wazungu,” Kinyarwandan for “white person.” It was disconcerting. As I have written, two Korean adoptee women have entered my life and are teaching me a little more about myself. They each adopted two Korean children, something for which I admire them deeply. In the process, one of them said her husband mentioned that the tables had been reversed once they visited Korea. In Korea, he couldn’t hide his race. His wife, on the other hand, could finally blend in. I have spent a good portion of my life trying to blend in and secretly wishing to meet someone as confused by race as myself. On the one hand, I wanted to be seen as white or Puerto Rican. On the other hand, I wanted validation that being Asian was okay. As a teen in the 80s, I searched Teen magazine for Asian models. There were few, maybe one every few months in the Teen Model Search finalists. TV gave me no respite. The media had few Asians other than Connie Chung, to whom I was often compared as I studied print journalism in the late 1980s, and Yoko Ono, to whom I was referred when I wore large sunglasses. At the time, I was trying to assimilate, and in my efforts to do so, I would often shun such comparisons. Regretfully, I didn’t share this feeling of alienation with my parents. My mother sensed some of it, as she special ordered an Asian baby doll for me. These experiences drive me today to create a better childhood for my own children. While they are mixed race, both Korean and Caucasian, they are often placed solely in the Asian category. My husband and I have sought to place them in racially diverse communities and schools. I’ve tried to make sure they see themselves as both races. We own a fantastic book, Part Asian, 100% Hapa. In it, photographer, Kip Fulbeck, has photographed numerous subjects who are part Asian, from children to adults. My children pour over this book. It is worn from all the page turning and marking. It affirms them and assures them that they are not alone in their confusing ethnicity. While I hated the references to Yoko as a teen, I relate to her now as a mother. Her son, Sean Lennon, has written the forward in Fulbeck’s book that addresses my children’s feelings. Yet, this book reassures my children that they are not alone in their feelings. They are indeed Hapa! This entry was posted in acceptance, adoptee, alone, Asian, assimilate, blend in, children, Connie Chung, Hapa, Korean, lonely, models, mother, Puerto Rican, race, Rwanda, Yoko Ono on October 25, 2012 by mothermade, the blog.